Nabarangpur-Online: Sree Laxmi Industries gutted in fire at Nabarangpur. Sree Laxmi Industries gutted in fire at Nabarangpur. 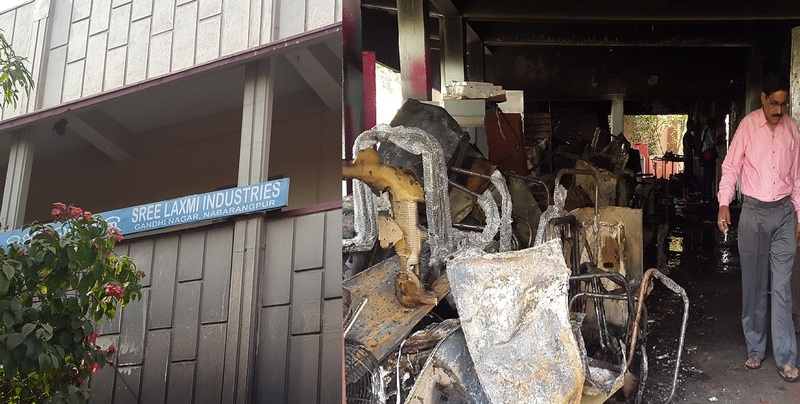 A major fire broke out at Shree Laxmi Industries gutted goods worth of lakhs of rupees. The fire broke out at the industries situated at Gandhi Nagar at morning here on Wednesday about 7.30 am. The proprietor TN Murty, informed to the fire control room about the incident. Seeing the gravity of the situation four fire fighting engines worked for about two hours to douse the fire. The fire brigade personnel’s succeeded in saving the upper stories of the Godown as well as part of adjourning buildings. Murthy said the fire caused a loss of Rs. 40 lakh. The damage goods comprised of Refrigerators, Air conditions, fans, chairs, tables, cushions and furniture’s including the structure. No causality was reported. There must have been a spark in the wire which easily spread the fire personnel’s said.